Our Cottage Bunkies feature a steeper roof pitch to give extra space for the loft and comes with 15 degree stairs. This gorgeous 10 x 16 Cottage Bunkie features two bar windows, a bi-fold window and triangular window in the dormer. The side door is steel and features a double-glazed window with internal security bars and a refrigerator-like door seal, ideal for colder climates. All our premium cedar doors are also available in steel construction at no extra charge. Double-glazed vinyl windows that are a close match to our cedar windows are also available. These windows provide a superior weather seal and are ideal for use with our insulation packages. Our cottage bunkies are constructed with cedar or maintenance-free siding, and cedar doors, windows and trim. All our cabins, cottages and bunkies come standard with 1/2" plywood roof sheathing and 2x4 SPF framing. Click on the pictures in the filmstrip to view larger images of the pictures shown there. Use the models listed in the design center as a starting point for your cottage bunkie design. 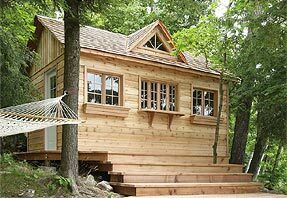 Use this design center to price and/or customize this cottage bunkie design. Use the different sizes shown below as a starting point.